Cool! Just make sure you reward low (on the floor) and as close to an object as possible as that gives you a better position for a free handstand. I wouldn’t go into that at that age just yet, it’s just to promote the right style for future work. Very nice distance and great coordination! At this point, it gets easier to reward with a toy as it’s easier to throw it far and it will give you even more distance. Thanks . 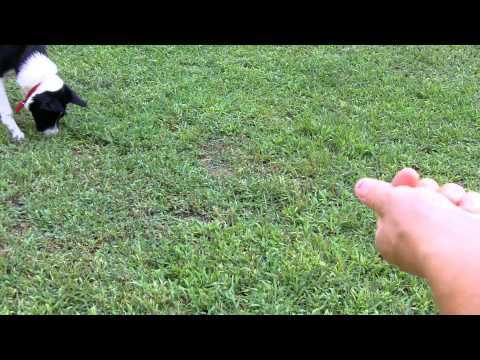 He offers this trick a lot and I do often use a frisbee to reward . I usually name and fade the target for one paw crossing and once done, take a target again, only click the other paw (you can first do it in another position, like sit, to make it easier to get the other one) and then go from there. Some steps in another direction is a good start, I would just keep working from there: stop clicking for two steps in that direction at one point and only click for 3, then 4 etc. For a sit up, try clicking as she is going up with front feet, before she touches your hand, to teach her it’s about lifting front feet, not really touching your hand. Later on, you can try moving it away before she can touch it and jackpot for any kind of duration. To get both feet at once for handstand, you need to progress to the height that doesn’t allow her to reach it with one leg only and requires the other leg off the ground some too in order to reach the object. Jackpot and keep making an object higher gradually, they learn at one point that pushing both legs up makes things easier as trying to reach it with one leg. Hind legs are hard for them to understand yes… I’m afraid I have no other suggestion as to keep working on the tricks you listed, together with cavaletti and 4in (always clicking as hid feet are going in). Once they get hind feet, it gets easy. Hello Silvia and everybody ! Very cool! Peeing is too cute! Can she do it with the other leg too? It’s important to always do both sides. A little unsure about that slamming, maybe try with something that makes less noise first? Or put something on it so that it doesn’t slam too much and she is more comfortable with it? Too funny with the sit up, La also does this “head in treat direction” pose. Great duration and balance! Pivoting looks great, just make sure you stand somewhat further ahead, so that her paws are where your heels are (not where your toes are) -- and reward with head higher up -- more vertical! Also, for future handstand, you need to reward closer to the object, so that she is more vertical. thanks for this feedback, Silvia ! Very funny about the arrows 🙂 so we were right to trust this kind of “navigating” : it stays for long time 🙂 🙂 !!! I would still work on slamming some, but not on a real see-saw as you don’t want her to connect it with anything bad, but maybe get a small plank (20x30cm is enough), put it on carpet to avoid too much noise and put something soft in the middle (a dog toy maybe) so that it moves some if she touches it and first work on that. Then move it to different floor to get her used to different sounds and only then go to doors and drawers again, you definitely don’t want her to stress about it. 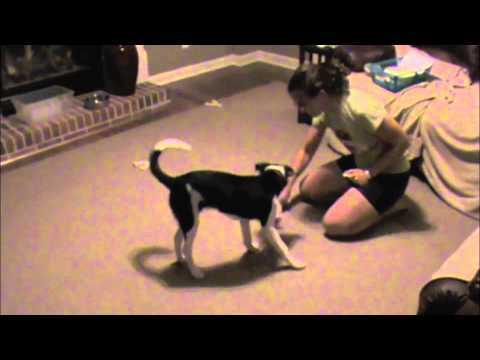 What a great job your doing with your puppy. I LOVE the sit up — so cute. I always enjoy watching your videos. Hi, everyone, we are back from some great weekends with dogdance and Agility. So we didnt’ go on so far, but we trained with lots of distruction and in very diffrent places with lots of dogs and spectators. So I think Ayoka learned much more than the tricks in this time. We had one Problem with ‘closing the door’ She always looked at me and was not standing in front of the door. She touched the door by lifting her foot to the side and so she has no force for closing the door. I need to correct her position, looking at the door, and then it works. 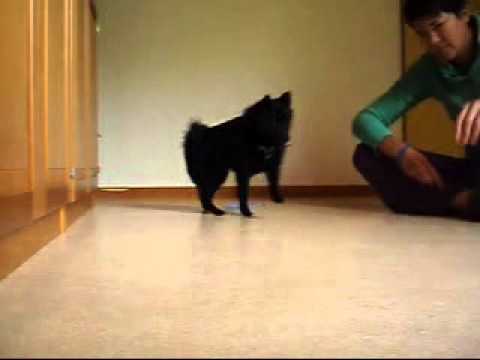 One more question: Don’t you think that teaching the handstand with this high target, as it is shown in some videos before, is to early for such young dogs? Isn’t it bad for the health of the dogs? 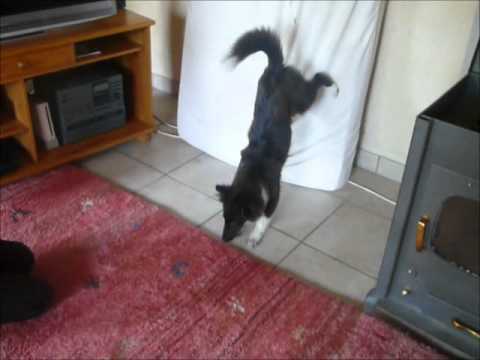 In our rules fo dogdance it is not alowed to do any backing tricks and tricks on two feets under the age of 15 month. What are your experiences? Great to see Ayoka back, she is too cute and sure doesn’t seem to mind any distraction 🙂 Very cool puppy! Slamming of the doors is getting really good now, BUT you can’t click twice for one action!!! Click once and then jackpot the best ones with more treats -- if you click again, you’re clicking for eating the first treat, not slamming the doors 🙂 For pivoting, try to not help with a hand so much as it’s hard to get rid of it. Very cute paw crossing! Great backing up the object. I have no problem doing lots of backing up with puppies, I think it’s good for them. I also do standing on side legs pretty early, it’s great for their balance. I don’t start with handstand without the support until they’re at least one year, but I will do some backing up on high object here and there with a puppy already. I think it’s good for them if you don’t do tons of it every day -- any repetitive action can be a problem for a young puppy, but anything is moderation is good, it provides them with an important info on how to use their body. Hi Silvia! Thanks a lot. Oh what a fool am I! I mixed up ‘clicking for duration’ with ‘giving jackpot’! It is hard for me not to help with the hand, because that’s the way I learned it to Roxy, but I try do do better. I am sure that with your training they will get a really goood bodyfeeling and it’s fun , too! We love to learn all the tricks! I have trained the beginnings of the handstand with my 5 month old BC , he has probably worked on this trick less than 10 sessions . I do think we need to be careful with our young dogs but they learn best at a young age . I think we need to approach everything in moderation . For instance today we went swimming , Heat my 5 year old BC swam for 25 minutes , the puppy swam for 5 minutes , he spent most of the time on the boat , another wonderful experience for him . I agree. Too much of anything can be a problem for a growing puppy, but a little bit everything is great for them as it gives them an experience on how to use their bodies etc. and that’s definitely a very important lesson that enables them to use it correctly, move more efficiently and avoid injuries. I’ve seen young dogs who were mostly kept in crates as puppies in order to avoid injuries… -- and they moved terribly, it looked like they will fall apart any time. yea, a middle way seams always the best. Cavalettis: She LOVED these the 1st time we did them. A bit less enthusiasm today, so I added her favorite toy at the end…she seemed to like that! Drawers/Doors: Again, a lot less confidence with this at home than in the hotel last night. Could have been my other dogs…we will work more on this one! Backing Up: I like how this one is coming along. The verbal is pretty new! Heel/Side: Remains one of her very favorites…and she’s VERY good at it! I think she’s ready for a lower and then faded target. 2o2o: Again, lower confidence tonight. This was looking pretty snappy yesterday, so I thought she was understanding, but not sure. Crossing Paws (opposite direction): So I guess I start to name it now? And then maybe alternate which cross I ask for for a session or two, and then start to ask for both in one session? Yeap, heel and side looks great, definitely ready to fade the target! One thing to be careful about though: she sometimes seems to lean on you more as ideal. You want her as close as possible, but not leaning on you as you can’t walk normally then. You usually get leaning if you reward with head too much out -- head in causes rear end out problem, head out causes leaning problem, so it’s important to reward with straight, vertical head. Keep working on slamming to get more power. Getting there with 2on2off, great understanding of the position, still some more work for understanding the stay until the release -- you can as well practice that with her sits and downs. Try to adjust your proofing challenges so that she is mostly successful -- those in the videos were maybe somewhat too much for now, add them very gradually. She also seems ready for backing up into 2on2off. Sounds like a good plan for paw crossing. Nice cavalettis and backing up! I am making a combined post for lessons 2+3. I have been away a lot because of my work so we have not done as much as I would like for this class (I’m noticing that many of you are lucky enough to have lots of time!). 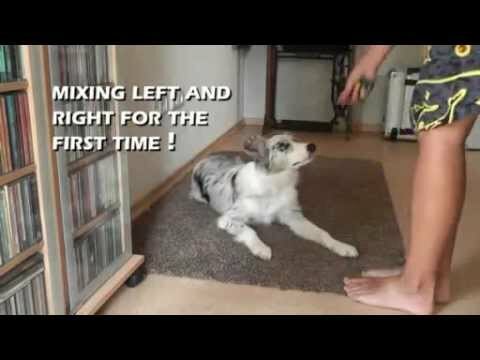 In the video I included the in-the-box status, target touching, backing up, and 2on/off with stays (ahem -- well, a second for my dog she considers a stay at the moment!). Sitting up we are also doing ok with but it is not on the video. For some reason she found that hard at first -- maybe lack of muscle? For my other dog this was a very easy trick. Backing up was also hard for her to get, but now it is ok. We have done lots of backing over rolled mats, jump bars and things, as I am yet to find some suitable stairs (most are way to big for her). She has quite a nice handstand too but does it the wrong way by getting on the object first and then dropping into position -- I have started it again now she knows how to back up. We are working on the stays with her lying in her bed -- this seems to be helping more than other positions and it is starting to improve -- being still in any form she does not like! Heeling i did not include an update (it has not moved much from our last video -- she is at the stage of learning the words for each leg touch). This will be a priority exercise for us this week. We are working only with the anticlockwise spins (“heel” side) at the moment as this is the much much weaker side for her. Closing things we have done and it was on an earlier video. Cavaletti -- well, we are doing a good job of this backwards, but when it is forwards she wants to proceed over it at full speed -- and this I don’t really want to stop! Socialisation is also a priority at the moment as Sen has developed a snappy attitude (I suppose thats what you get when you are operated on 4 times in 6 months -- she thinks everyone is out to cause some pain 🙁 ). She goes everywhere possible, and to one group puppy/obedience class a week, and once a week to an agility hall (where she only plays and trains tricks, LoLaBu homework etc while other dogs work next to her). City centers are hard for us to get but this week we can manage (its a 300km trip). Usually I go to our local airport when there is a flight arriving as thats the biggest crowd I can get (but I can’t film there). And so we owe you some tricks still. Unfortunately I have to prioritise a little with this class. It would have been better to have this course on its own, but eventually we’ll get to it all. Great job! Getting there with 4in, time for a smaller box! If you are still working on duration and stays, I would suggest you to for now still reward the position too, not only the release and then fade rewarding in the position later on, when she knows it’s about duration already. Very cute back up, very cool toys 🙂 And yes, sit up requires quite some muscle, so it’s difficult for puppies, even when they weren’t operated on a leg, so it’s important to add duration slowly, you don’t want them sore after! For handstand, you need back feet up first yes, to eventually be able to fade the object.